Enroll in health insurance by January 15 for coverage that starts February 1. The new year is a time for new beginnings — or at least thinking about them. If you’re considering starting your own business or taking a similarly bold step in 2016, one thing you won’t have to worry about is buying health insurance. Like millions of other Americans, Leslie and her husband, Bill, have the freedom to pursue their career dreams, because they aren’t tied to a job just for the health insurance. That freedom was not possible before the Affordable Care Act (ACA), or Obamacare. Buying private health insurance was prohibitively expensive for individuals — if they could even get covered at all. Many were denied insurance due to pre-existing conditions, like Leslie’s. Leslie and Bill, who live in Michigan, are both self-employed, as a visual artist and software entrepreneur, respectively. Leslie has cholesteatoma, benign tumors in her middle ears that must be treated surgically to prevent serious complications such as meningitis. She’s already had some hearing loss, too, so doing nothing just is not an option. Leslie says they told their story to Republican U.S. Congressman Tim Walberg, an opponent of the ACA, at a town hall meeting. This would have been a pre-existing condition, which would have prevented Bill from starting his new company if we had been dependent on insurance from an employer. The ACA is letting him start a new business which will create jobs. Without the ACA, Leslie says, Bill couldn’t have launched this company because her healthcare is expensive — regular monitoring and CT scans and surgery when required. Plus, two of their three children are on their insurance, so they need a plan that covers all four of them. Like every savvy shopper should, Leslie says she balances premium vs. deductible vs. copay, and looking closely at the network — are all their doctors and their kids’ doctors included? — as well as other services like physical therapy. Our friends at Get Covered America have a nifty tool that can help consumers make all those comparisons. The super-easy Get Covered Plan Explorer lets you weigh the variables of a number of plans side by side so you can choose the fit that’s right for you. You can also find local, in-person help for making your buying decisions, using the Get Covered Connector. Whatever your dreams are for 2016, it’s easier to pursue them if you’re healthy and not worrying about what might happen if you get sick. For millions of Americans like Leslie and Bill, Obamacare means more freedom. 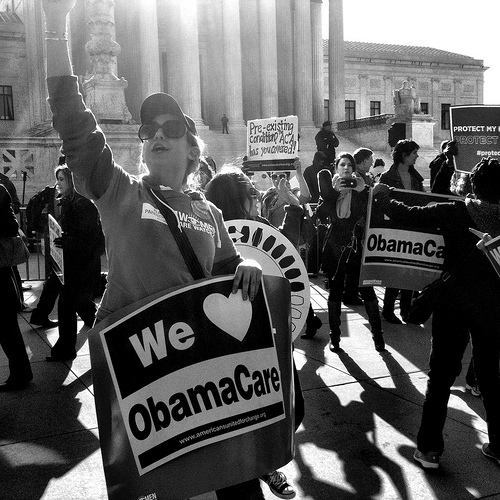 The ACA gives us more agency over how we run our lives. Our family has the coverage we need, while my husband was able to start his new company. The ACA gives us a lot more flexibility. Open enrollment for 2016 coverage ends January 31 — so enroll today at Healthcare.gov and get the New Year off to a healthy start.